ESPN’s Adam Schefter reports that the San Francisco 49ers have released veteran quarterback Brian Hoyer. The move comes after the team traded for quarterback Jimmy Garoppolo for a 2018 second-round pick. Hoyer, a nine-year veteran, started the season as the team’s starting quarterback, before he was benched in favor of C.J. Beathard in Week 6 against the Washington Redskins. 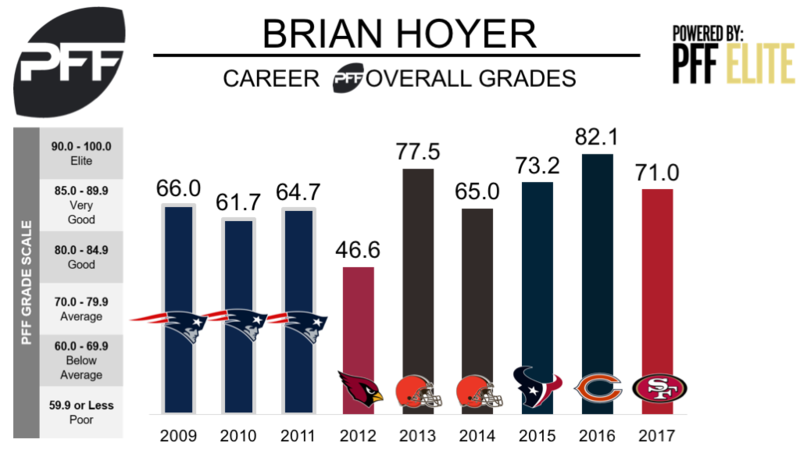 Hoyer largely failed to live up to expectations this year, and in his six games, he achieved a PFF overall grade of 71.0, ranking 27th of 34 qualifying quarterbacks. This season, Hoyer had difficulty moving the offense, largely due to inaccuracy and his struggles when throwing the ball downfield. Through six games, Hoyer’s adjusted completion percentage (the PFF metric that shows a clear measure of accuracy) of 68.9 percent ranks 28th of 35 quarterbacks with at least 175 attempts and his passer rating of 52.8 on throws of 20 or more yards ranks 30th of 33 quarterbacks with at least 10 deep attempts. Garoppolo’s departure now leaves Tom Brady as the only quarterback on the New England Patriots’ roster, which leads many to believe that it would make sense for Hoyer to head back to New England. Hoyer spent the first three years of his career backing up Brady in New England, and played 84 snaps in relief from 2009 – 2011.